Acer Iconia Tab 10 A3-A30_n2Cbk_316T (16GB) Cos blue. Condition is Used. Excellent condition. Shipped with USPS Priority Mail. Trending at $32.74eBay determines this price through a machine learned model of the product's sale prices within the last 90 days. Acer Iconia One 7. LOCAL PICKUP Proceeds are used to support local programs and services. Iconia One 10 B3-A50FHD-K5CZ Tablet. Form Factor: Slate. TV Card: No. Depth: 10". AC Adapter. Wireless LAN Standard: IEEE 802.11ac. Weight (Approximate): 1.23 lb. Width: 6.7". 5 product ratings5 product ratings - Acer Iconia Tab 8 A1-840 16GB, Wi-Fi, 8in - White Fast Shipping! |: Acer Iconia One 8" Quad Core Android Tablet Wi-Fi 16GB 5MP B1-850 A6001 White. Model: A6001. Product Line: Iconia One. Storage Capacity: 16GB. Processor: Quad Core. Type: Tablet. WHY BUY FROM Spartan Technologies?. The Acer A100-07u08u is suitable for professionals who travel constantly. The Wi-Fi tablet’s webcam aids video calling and chatting. You can easily transfer data at high speeds through the USB port from the tablet to an external storage device. ACER ICONIA TAB A500-10S16U. WITH ALL ORIGINAL ACC. SIGNATURE CONFIRMATION. RAM(2GB (1 x 2GB)). Processor Type(AMD C-60 Processor). Make(Acer ). Screen Display(Glossy Screen). Screen Size(11). This laptop has been tested by our techs and works perfectly. Data has been wiped. It has 8.92GB free of 29.7GB on the hard drive. WIFI ready. NEW IN SEALED BOX Acer Iconia One 8 Tablet B1-820 16GB in White color. Condition is Brand New, sealed in plastic. I ship next day after payment is received. Will mail fully insured by Priority Mail Usps. Because this is brand new/sealed in plastic, it is non returnable once opened. Contact manufacturer if there is a manufacturer issue. Make: Acer. Check with the manufacturer for more warranty information. UPC: 884483957767. Model: W500-BZ467. Acer Iconia B3-A40 10.1" 1920x1200 display, Android 7.0, MT8167 1.5GHz System on Chip, 2GB RAM, 32GB eMMC Storage. Check-Out Now! ACER ICONIA TAB A500-10S16U 16GB Wi-Fi with Case. Includes leatherette case. Acer Iconia w500 Tablet / PC. Product: Acer Iconia Tablet W500. 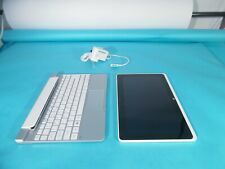 Acer Iconia Tablet W500, AMD C-50, 1.0GHz, 10.1" w/Keyboard Docking. Integrated Webcam: Yes. AMD Dual-Core Processor C-50. 32GB Solid State Drive. 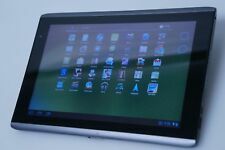 Acer Iconia Tab 8 W NT.T.L7GAA.006;W1-810-14ZE 8 32 GB Tablet! New in open box tablet was never set up still in plastic wrap. Comes with cord and paperwork inside box. Free shipping. See pictures what you see is what you get. The acer W4 windows tablet pc. Come with tablet only. In great condition. Acer Iconia W510 Windows 8 PC/tablet. Touchscreen, bluetooth, wifi, and webcam, HDMI. Iconia One 10 B3-A40FHD-K0MW Tablet. The convenience of a tablet with the power of FHD and dual port access. Product Type: Tablet. Form Factor: Slate. TV Card: No. Height (Front): 0.36". Color: Black.